As a parent, when you get a call saying that you need to leave work to pick up a sick child, you are put in a tough spot. You don’t want to use your vacation to stay home with a miserable child (that’s no vacation! ), you may have limited sick leave, and you may not have anyone else to care for the child. At the same time, you care about your child’s health. You may find yourself hoping that your child care provider is overreacting and that your child is not really sick enough to come home. Fever — While a high fever is worrisome, a child may have a slightly elevated temperature due to teething or a recent vaccine. 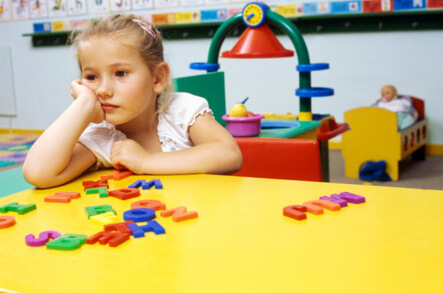 In these situations, day care providers do not need to require that a child be immediately taken home. Rash — Common, non-communicable rashes, such as baby acne or eczema, do not require children to be separated from each other. On the other hand, chicken poxis highly contagious. Vomiting— One episode following active play may not be a problem. One episode a day for several days needs to be looked into. Multiple episodes on the same day or vomiting accompanied by general discomfort would necessitate taking a child home. New research comes out frequently that changes how childhood diseases are handled. Fifth Disease is a case in point. Until recently, it was routine practice to confine children with the Fifth Disease (also known as Slap Cheek) rash . Now we understand that this is not necessary. As with Roseola, when the rash appears, the child is no longer contagious! By keeping up with the latest infection-control guidelines you can avoid unnecessary trips to the school or day care center.